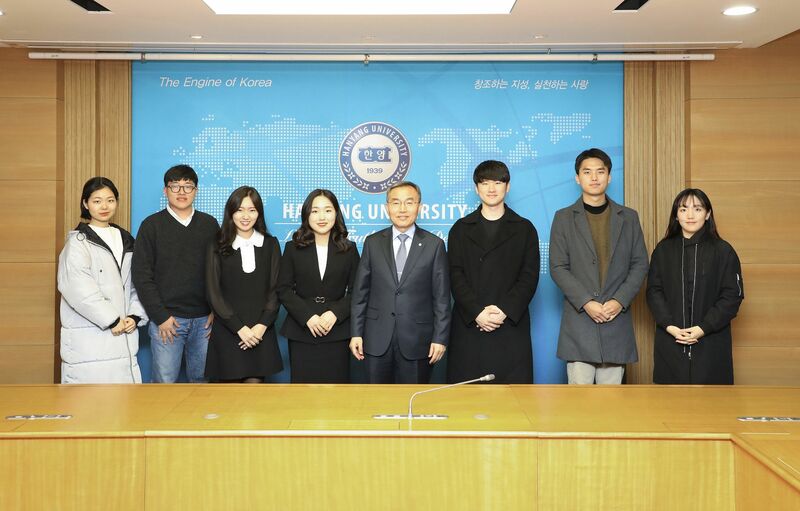 After the board meeting on January 11, Professor Kim Woo-seung, from the College of Engineering at the ERICA Campus, became the new president of Hanyang University (HYU)'s Seoul Campus. He took office after the retirement of HYU's 14th President, Lee Young-moo. Professor Kim's term started on March 1 and the presidency is expected to last for four years from now on. 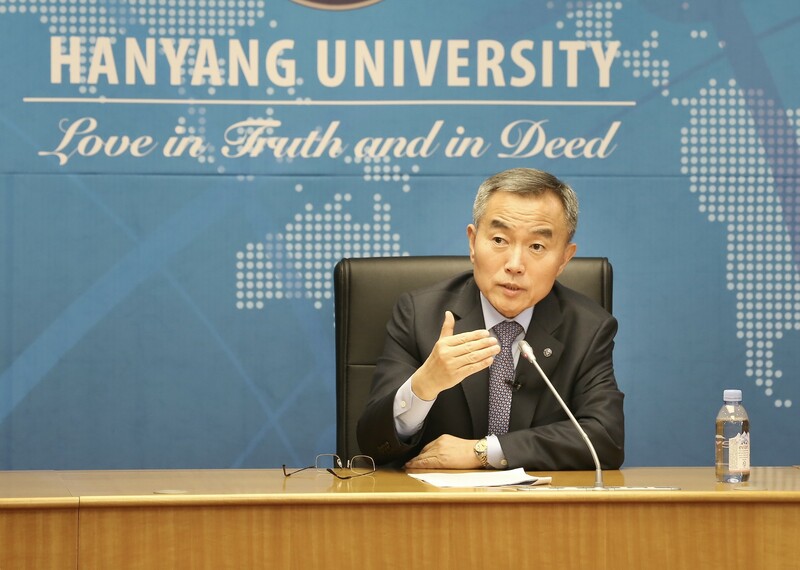 The Hanyang Journal interviewed President Kim Woo-seung to hear about the vision and upcoming plans he has for HYU and its students. Q. How do you picture Hanyang University after four years? A. I would like to say, ‘A university accompanying with the world’. Even though the programmes and systems are of good quality and are similar to famous universities from around the world, a university that is disconnected from the world cannot be said to be a ‘great’ university. I want HYU to be a university that continues to interact with the world through research, education, and social innovation projects. Q. During your inauguration ceremony on February 25, you concentrated on four concepts that you wish to focus on during term, which were: increasing global competitiveness, creating synergy amongst campuses and divisions, sustainable innovation, and HYU's '3S' visions (Smart, Start-up, Social Innovation). Out of these four concepts, which concept would you like to focus on the most, and why? A. While all four concepts are important, I would like to focus on the '3S' visions in particular. This is because firstly, the ‘3S’ visions will allow the history and tradition of our university to be continued. 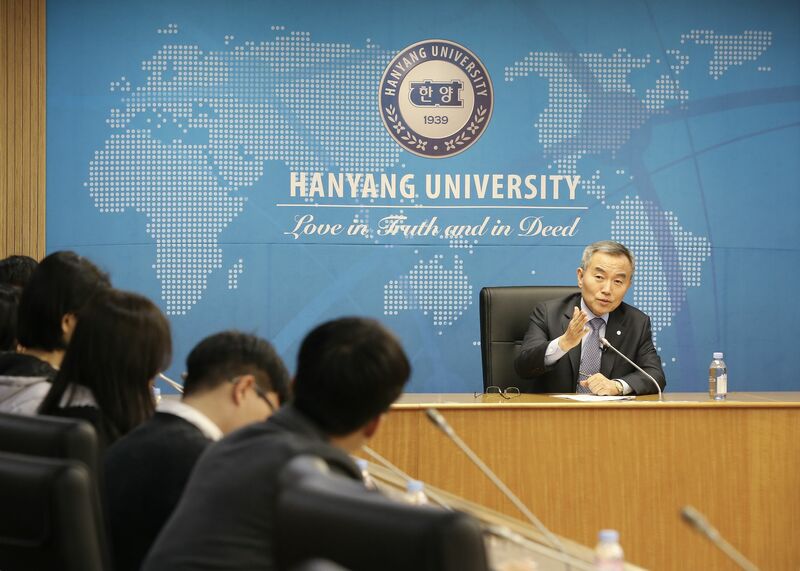 HYU was built under the spirit of ‘saving the country through technology’ and ‘pragmatic academics’, and we have been praised since we devoted ourselves to the modernization process of Korea. Henceforth, HYU now has the motto, ‘The Engine of Korea’. Second, the ‘3S’ visions will sustain and develop HYU’s achievements. HYU has successfully hosted government-funded programmes such as LINC+ and PRIME. Both Seoul and ERICA campuses are ranked highly (Seoul 3rd, ERICA 9th) in the university rankings. This is the result of Korea’s very first revolutionary education, such as the introduction of the Industrial Advisory Board in 2017 and systemized mandatory internship programme in 2013. I believe that the ‘Smart’ spirit of the ‘3S’ visions will sustain and improve these results of pioneering education. Third, the ‘3S’ visions surely suggest HYU's direction of innovation. The era for universities to interest itself not only in education and research but also in social problems and cultivating social pioneers has come. From now on, HYU will provide solutions to social problems and be a leading model for universities in Korea as a social innovator. Further specific plans to promote ‘3S’ visions will be announced this August, through the HYU 2022 Mid-term Development Plan. Q. Students believe that communication between HYU's two campuses is not active. Could you please explain to us more about the 'HYU Co-Development Special Committee', and how is HYU going to cooperate and form a committee in terms of co-developing the two units through it? A. HYU's Seoul Campus is now greeting its 80th anniversary and 40th for the ERICA Campus. They both have achieved outstanding goals in their own fields. ‘Co-Development’ means that we will create an innovative synergy which supersedes the previous successful events we have created individually. To enable this, the ‘Seoul-ERICA Hanyang Co-development Special Committee’ will be installed. All possibilities opened up when it came to cooperating with the two campuses. For example, when the College of Medicine in the Seoul Campus and the College of Pharmacy in the ERICA Campus collaborate, an innovative synergy within the life science field will be spotlighted as one of the major futuristic research fields. The meaning of co-development goes beyond the traditional expansion of communication within campuses, but it reaches further to the fusion and development by placing emphasis on the Seoul and ERICA Campuses' strong points to create HYU’s own synergy. Q. We heard that you are planning to enhance the quality of education for foreign students, not just expanding the number of such students. What are your plans in regards to that? A. There are many foreign students in HYU. Some say quality comes out of quantity, but others argue that we need qualitative development as well. We will do our best by offering courses of good quality. Also, some students suffer due to their lack of Korean ability. Those issues will be fixed as well so that foreign students can take qualified lectures from the HYU professors and we can help them settle down in Korea along the way. Q. What would you like to emphasize to HYU students, faculty members and others who are related to the university? A. University is in charge of accepting local and societal demands and cultivating vital human resources who are necessary to this changing modern society. However, due to the decrease in the number of students and financial hardships, along with the paradigm change due to the society's atmosphere, universities are facing a high wall. Looking back the past 80 years of HYU’s history, such obstacles were the core motivations of HYU’s development. The harsher the request for change and challenge was, the more shining achievements HYU made through early responses and energetic innovations. With active communication and cooperation within HYU, I would like to set a cornerstone for the upcoming ‘Hanyang 100 Years’, which shall be more glorious than the past 80 years. Q. Do you have any final words for the HYU students? A. Dietrich Bonhöffer, a German theologian once said: ‘Action springs not from thought, but from a readiness for responsibility.' Along with this quote, I also believe that those who can take responsibility can only act. What is more important than chasing your passion is having your own career assets, which would allow you to do what you have to do. To have this, career records that exceed your limitations are necessary. Some may brutally criticize you. But the ability to respond against it is an essence. An ability to take responsibility creates the ability to put it into practice.